Are you ready for a decidedly feisty and fishy take on the underwater slots theme? If so, then Fighting Fish is definitely the game for you! Coming out of the legendary depths of the world famous Microgaming collection, Fighting Fish is an undersea adventure slots game that boasts of a boatload of Re-Spins, Multipliers, Wilds, Scatters and a much welcome Gamble feature that provides hours and hours of wet and wild online slots enjoyment. 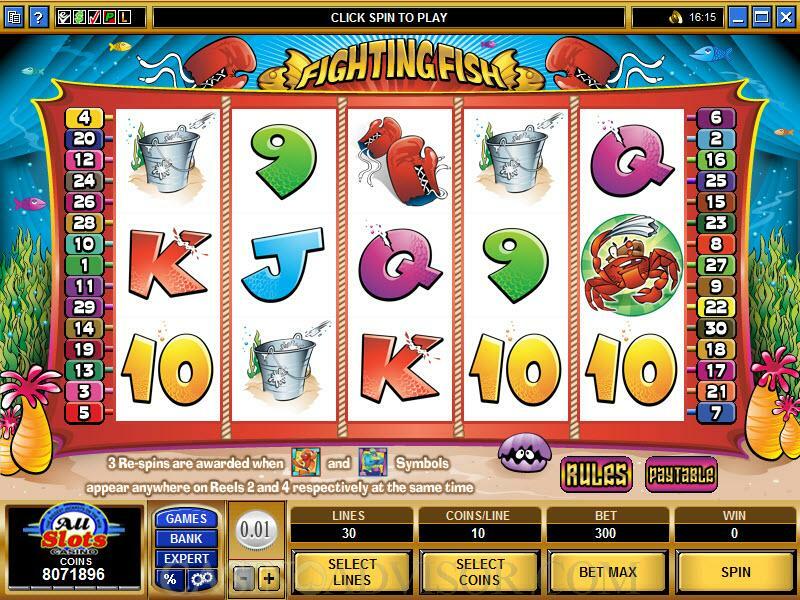 Fighting Fish offers 5 reels and 30 paylines of video slots action, and the graphics depict a wacky undersea boxing arena suitably depicted with well-rendered graphics of fish vying for the title of Deep Sea Champion while a host of crustaceans lend their support. 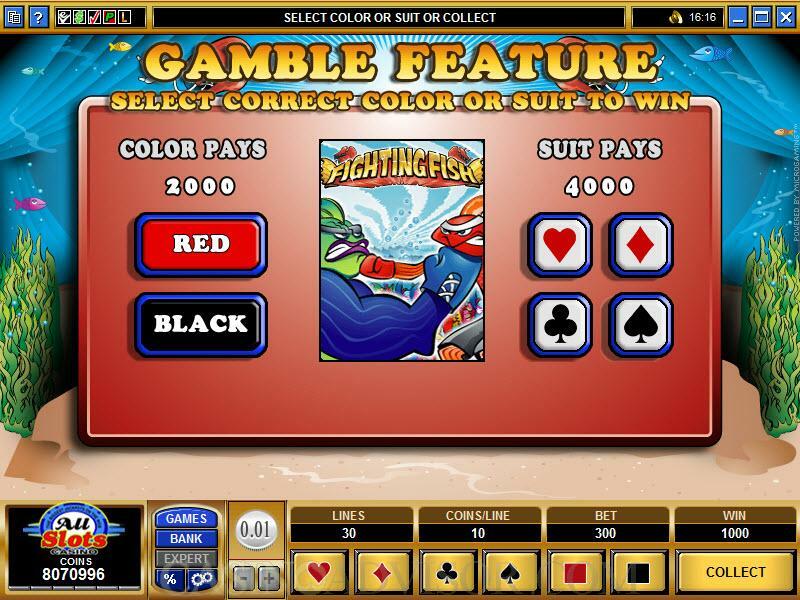 Fighting Fish offers players the opportunity to double or quadruple their winnings by getting the right colors and suits. This serves as the game’s Gamble feature, and it can potentially get you up to 10,000.00. 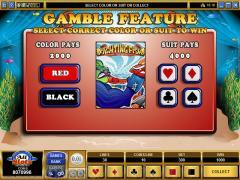 Fighting Fish is a video slots game from the Microgaming collection that comes with an entertaining fish-theme. Throughout the game, players are entertained with a host of undersea creatures and props such as red and blue fish, boxing rings, gloves, and a whimsical crab referee that is humorously depicted in cartoon fashion. A winners belt and the familiar A, K, Q, J, 10, and 9 symbols are also included, and they hold the key to some truly outstanding prizes. While a bit worse for wear no doubt due to the pugnacious nature of the fighting fish these symbols are no less valuable. You will want to keep a close eye out for the red and blue fish symbols, as they only show up on reels 2 and 4. When they do however, they can take the place of every other symbol in the game with the exception of the boxing ring symbol, which serves as the scatter. When the red and blue fishes show up on reels 2 and 4 simultaneously, you are in luck for this causes the game’s free spin to kick in. Here, the fish magically spread out and cover the entire reel, and you get up to 3 re-spin opportunities. In this part of the game, the 2 and 4 reels stay right where they are, although reels 1, 3, and 5 spin 3 more times. You will be given the chance to pick out one of the fishes as your contender before this re-spin section is triggered, and if it happens to win the match, you effectively get your re-spin prizes doubled in value! 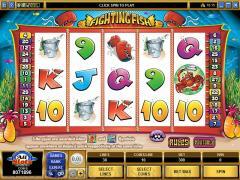 Like many other games in the Microgaming collection, Fighting Fish offers a Gamble feature, providing even more wining opportunities. Interested in reading more detailed information about Fighting Fish? If so Click Here for more details.